This Resource Pack deserves a whole lot more popularity. It's really smooth to me, doesn't hurt your eyes! Downloads seem to be going up exponentially, it took a month to reach 1000 Dls, but it looks like i'll get to 2000 in less than a week more. Wonderful! It is already a usable WIP and im using it!! When you get the textures done then you should probably add sounds. In my opinion the sounds in MC are of a pretty high quality, much higher than the default art. And my skills are more on the visual side. I'm not interested in making a sound pack that lowers the quality of the sounds, so i'll probably leave that alone unless something stands out to me that i could improve. I believe the grass could be done better. Looks a little bland. Maybe more shading? Or more brighter green colors. No i ike the grass! I've since learned how to inject more color variation in the blocks minecraft recolors, so I'll probably go back and redo grass blocks sometime, to mix green and less green in the same block. I'm not happy with the side, but the top image, seems to me to have about the right about of texture. I'm not a fan of beta-style super saturated green grass, and neither do i like some of the biome colors vanilla chooses. I haven't decided how much variation from vanilla biome colors my faithfulness goal allows, but changes, if any will be more about fixing weird unrealistic colors such as swamp and tundra than pumping up the saturation. You made hardly any of these textures... Mostly stolen from Vattic. Which should be pretty obvious-- most of mine look very different. A few are sorta similar as we're both trying to be more or less faithful to the default, and we happen to hit on the same approach. But anyway, let's skip the pointless my-word-against-yours stage. If you are going to make those accusations, please show which of my textures are the same as Vattic's. That is so not true Rainbow, this is semifaithful and also they look very different . Here is the difference: Vattic just doubled the pixels, smoothed somethings out. But lithos is faithful i am pretty sure he started this by sketch . Here is the difference: Vattic just doubled the pixels, smoothed somethings out. But lithos is faithful i am pretty sure he started this by sketch . I believe the result is way more important than the process when evaluating art. The result is what matters, and the process is just one possible way to get the desired result. I don't think it matters weather vattic ran default textures through a filter, or built each texture pixel by pixel, or something in-between. It's the job of the artist to make sure whatever process they use produces something good. Do you like what vattic ended up with? 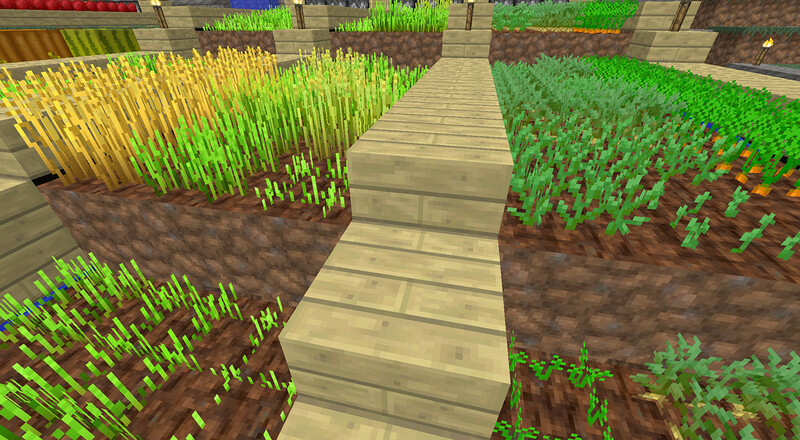 Do you like what I ended up with, or do you prefer some other texture pack(s)? That's what matters. Different, sensible people will answer those questions differently. But for what it's worth, my process varies according to my mood, and the texture i'm working on. Sometimes i start filtering or painting over default textures. A few times i've started with my photos. Sometimes i start painting from scratch. Sometimes i start with a texture i've already made. My goal is, while being mostly faithful, to offer players something nice they don't get from vattic's or any other 32x32 faithful pack, so copying him would not be helpful, and even referencing his pack much would tend to make my pack less distinctive. True, but eleazzar, you are not allowed to have adfly links read the minecraft forums texture packs rules. Well, of course, i welcome more adfly click, but 40% is better than i expected for a WIP pack. What rules? I've looked at the remotely relevant sounding stickied threads, and if there are rules in there, they are hiding really well. IMHO rules should be clearly stated in a sticky with a title that includes something like: "READ THIS BEFORE POSTING", and other stickies should be kept to a minimum. Wow, looks really nice! Downlaodin! If these are the rules, and up to date, (and i haven't seen anything official from these forums linking to there) then i don't see anything prohibiting me from using Adfly. Where do you get your information? Font demons slain, d3fin3d's HD font is being re-added No more eye strain! Note HD fonts are only free of issues in 1.6.2. This is a big release with 46 new and updated textures, and the total number of block textures done reaches 72%. All Grass: slight color variation. Birch & Oak "fancy" setting leaves, that i forgot to put in the last pack. This is probably one of the best resource packs i've seen so far, I JUST downloaded it, and I'm fairly surprised on how well it was done. Great Job! My glass may not be completely faithful, but, vanilla style streaky glass really annoys me. I want to see through the windows. Fortunately for you, glass is an easy thing to edit, and/or you can usually swap out glass images from other texture packs without much clashing. Hey, this is an extremely well texture. I've always wanted one that stays truthful to the original but looks this good. This is the first time I found one so well done. Great job! One suggestion, you should do a bumpmap and specular map version later after you finish. (If you still have to use that method) That way people can use different shaders with this. Also, the stone texture feels a little, rough. Almost looks like cobble. Maybe you could add some subtle lines to it to have a "Slate" feel to it? Amazing job again! Thank you for not keeping the potatoes and carrots looking like clumps of glowsticks shoved in the ground. They're seriously such an awful colour.